Trent University Oshawa Thornton Road Campus is holding a free public talk entitled, “The Politics of Space and the Performance of Place in Prehistoric Peru” by Dr. Edward Swenson on Monday, November 1 at 2 p.m. at 55 Thornton Road South, Room 125. Professor Edward Swenson teaches anthropology at the University of Toronto. 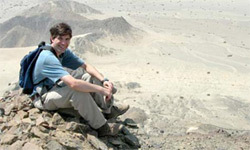 He is currently directing large-scale survey and excavations at the prehistoric urban complex of Canoñcillo in northern Peru. In his presentation, Prof. Swenson will demonstrate how archaeological investigations of the architectural staging of public spectacle can provide an effective means of interpreting cultural variations in power relations and the politics of place in the ancient Andes, using Late Formative (300-100 BCE) and Moche (AD 550-800) ceremonial architecture from the Jequetepeque Valley in northern Peru as an example. This free event is open to the public. Everyone is welcome.